We have already provided lots of Important GK Question Sets, Maths Quizzes with Answers, Spotting Error Quiz in English and many more. Today, it's the time to provide some conceptual notes on Soil Conservation Methods. No-tillage farming : Planting without first removing the existing plant cover and previous crop residues. Minimum tillage farming: Shallow ploughing only to the depth needed to ensure quick seed germination and leaving crop residues and ground litter to protect the soil. Contour Cropping: Ploughing and planting along the contours of the land so that water cannot runoff of the soil as easily. Strip Cropping: Alternating strips of close-growing plants( such as grass or clover) and regular crops (such as corn, cotton, potatoes).The strips of close-growing plants slow water runoff and when combined with contour cropping can reduce soil erosion by 75 percent. Terracing: Developing flat, step like terraces to reduce water runoff on very steep slopes. Crop Rotation and Cover crops: Planting fields periodically with close-growing secondary crops that allow less soil erosion and planting dense-growing cover plants when no crop is being grown. Gully reclamation: Seeding gullies with quick-growing plants and using check dams of manure and straw to reduce erosion. Windbreaks( Shelter Belts)- Plnating rows of shrubs and trees as wind-breaking barriers along the windward edges of croplands to reduce soil loss from wind. Replanting trees on land no longer used to grow crops. 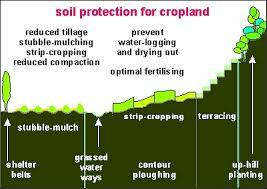 Not planting marginal land: Raising crop yields on good land to reduce pressure on farm marginal land. Land classification and Zoning: Classifying land according to its suitability for cultivation and using land use zoning and controls to prevent the loss of good cropland and the planting of marginal land.